Josh Miller, founder of FarmShots, a wholly owned subsidiary of Syngenta. Q. How did you come up with the idea for FarmShots™ Satellite Imagery Service Provider, and how has it become part of the Syngenta suite of digital tools? 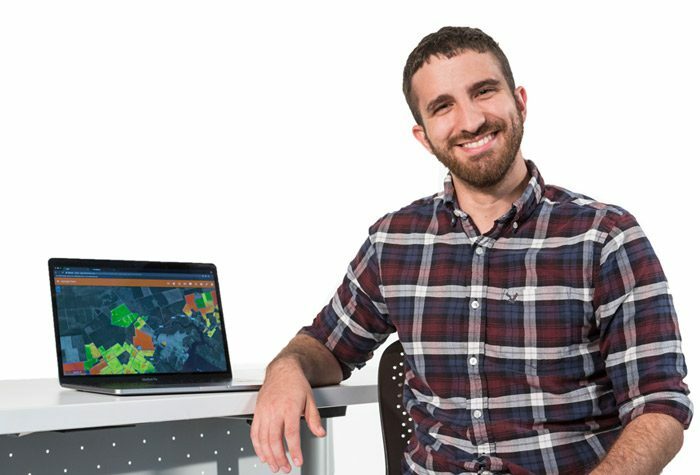 A.	Josh Miller, key account manager for Digital Agriculture at Syngenta and founder of FarmShots, a wholly owned subsidiary of Syngenta: While working with agronomists a few years ago, I realized that farming operations had undergone tremendous growth over the past several decades. Backing up my observations, the U.S. Department of Agriculture’s Economic Research Service reported this spring that the average farm size nearly doubled in just 25 years, going from 650 acres in 1987 to 1,201 acres in 2012. As the number of acres that growers manage expands, the challenge of detecting and controlling damaging pests, diseases and deficiencies also increases. I wanted to build a product that would help growers manage their farms more easily and efficiently. FarmShots is a platform used by agronomists, retailers, farmers and insurance agencies to locate damage caused by diseases, pests and nutritional deficiencies in crops around the world. Using satellite imagery, we’re able to detect that damage earlier, ensuring recommended treatments are accurate and applied before it’s too late. This year, Syngenta acquired FarmShots as an extension of the Global Digital Ag team. FarmShots was a great fit for the company’s existing suite of digital ag tools and will help accelerate the growth of integrated crop management. Q. How does this technology work, and how does it benefit growers? A. Healthy, dense vegetation absorbs light. In contrast, unhealthy, less dense vegetation reflects light. A satellite can see the differences in the amount of light absorbed by different areas of the field, allowing us to generate a map of the plant health across the entire field. Growers and their advisers can use this map to isolate areas of the field where a condition may be negatively impacting a crop. They can also use the same map to precisely target where a crop protection application should go. Satellite data is often the simplest piece of information to acquire about a farm. All we really need is the location of the farm and permission to access it, and we can handle the rest. This data allows Syngenta to give a lot of valuable insight to the grower, without asking for anything in return. Growers can use the imagery analysis to detect problems early. Whether it’s spotting application skips earlier or identifying irrigation issues quicker, this program helps growers find costly problems in fields, before they have a chance to impact yields. Q. How can advisers use this technology to help growers? A. Imagery is a great discussion point for growers and their advisers, who may include consultants, agronomists or crop protection resellers. In addition to being able to watch every acre for problems, growers will be able to show these images to their advisers to get recommendations for timely intervention. Within the program, advisers can upload notes, photos and measurements to communicate more thoroughly with growers. Agronomists can use the maps to generate variable-rate prescriptions, so growers can precisely target trouble spots. The program also includes historical data and imagery. With the historical imagery, advisers can help growers identify problem areas in advance to assist in planning at the start of the year. Multiyear records can help prevent some midseason cost surprises and give resellers the opportunity to advise their customers on potential applications. To help growers protect their fields for the future, the maps can also track problem areas and map out where weed resistance is becoming an issue. Q. How can growers access FarmShots? A. FarmShots is a web-based app available on all devices, including tablets, laptops and smartphones. It’s now built into the AgriEdge Excelsior® program through an integration with Land.db® software. This integration is really what makes FarmShots unique and easy to use, especially for growers who are already enrolled in AgriEdge Excelsior. They can just log in to their personalized account or talk to their AgriEdge® specialist. If growers are already using Syngenta digital ag solutions, their farms are already set up for seamless integration with the FarmShots rate application tools, without any additional data entry from growers. It’s important to note the Syngenta privacy pledge remains intact for growers who tap into the FarmShots technology. They maintain control of their data, which continues to be securely hosted in a cloud environment. Advisers and others can only see that data if growers grant them access to it. To learn more about this program, growers who are not already enrolled in AgriEdge Excelsior should contact their retailer or Syngenta representative.